Do you remember the time….? My Momma would have loved…. Do you remember that song…? Dreams and memories melding together. The future and the past weaving in and out of one another. Laughter the echos in your heart. Time marching on, yet somehow standing still. The birdsong of the evening. The love song of our hearts. Listen, My Dear, and You Will Hear…. The singing of my soul. The future and the past…. both here in this moment. The present. The gift. The now. Far, far, far, far, FAR too long. 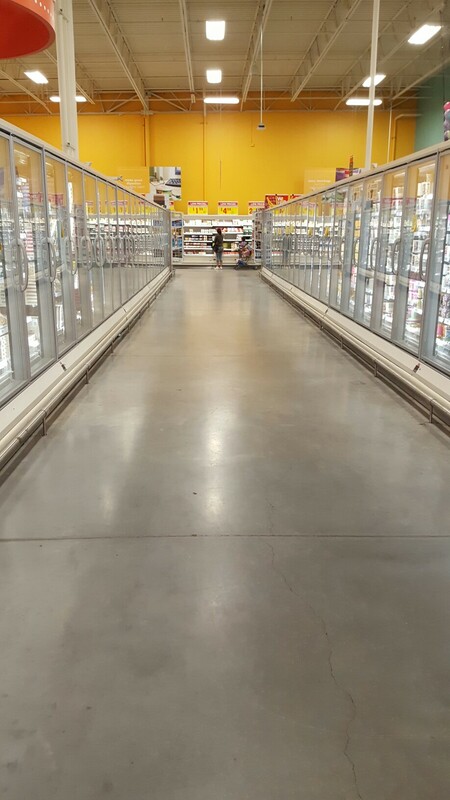 Since I’ve had danced my way down the frozen food aisle. Ever noticed how the lights come on as you walk down the aisle? It’s as if it’s your very own runway. Your very own catwalk! The ice cream. The broccoli. The waffles… All of it just waiting for you to approach. It would be rude, really, to not reward such adoration with SOME sort of recognition. Some sort of appreciation. Plus there’s the 80s music playing throughout the store, you know…. And as I dance, I smile. And I sing. And the worries of the world fall away. The music has to be playing. And most importantly, the lighting must be right… and the lighting is ONLY right if the aisle is empty and waiting for you. I MAY have, on occasion, waited for the lights to go out… Just maybe, I’ve stalked families to calculate their departure from this sweet aisle of mine… It could be that I did that today, in fact. Could be….that I danced my way down this icy red carpet … singing “Sweet Chiii-iii-iii-iilll-d of miii-iii-iiine” a little more loudly than I should. Could be… they were playing my song! Let me preface this by saying – for better or worse, good or bad – my Girlchild is one of the people who knows me best. She, probably more than anyone, has seen me at my lowest and most unhappy with myself. She’s seen more of my self-loathing and sadness than I’d like…. But perhaps it’s okay for me to be my absolute self with my kids and steps now that they’re adults…? They are some of my favorite people afterall. So…. Maybe? These words from the Girlchild several months ago stopped me mid-step. …and then a few weeks later. And finally, on the occasion of my 50th birthday, the gift that brought on the ugly cry. At the top of each page, a guiding question or sentence stem. It stalled me for days…. but because I love her, I started to write. I’ve got several pages of easy ones ahead. Reasons why I love the many things that I love about my life. Then comes the favorite memories section….including family members near and far…and I cry at the very thought of what I’ll say. And on and on and on it goes. Swinging from easy prompts that make my heart sing, to challenges that make my breath catch in my throat. I’ve only just begun this odyssey into directed reflection, but already I can see her genius and wisdom. Goodness, that girl is smart. She’s leading me to the edge and urging me to take the next step. Words to take to heart. And thoughts to mull and muse and scribe. 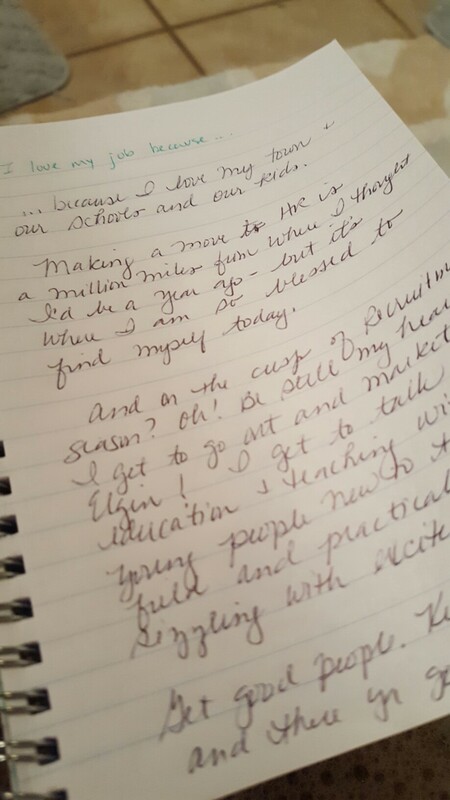 Writing it down makes it real. Pen to paper. Heart to hand. Oh, how the student has become the teacher. 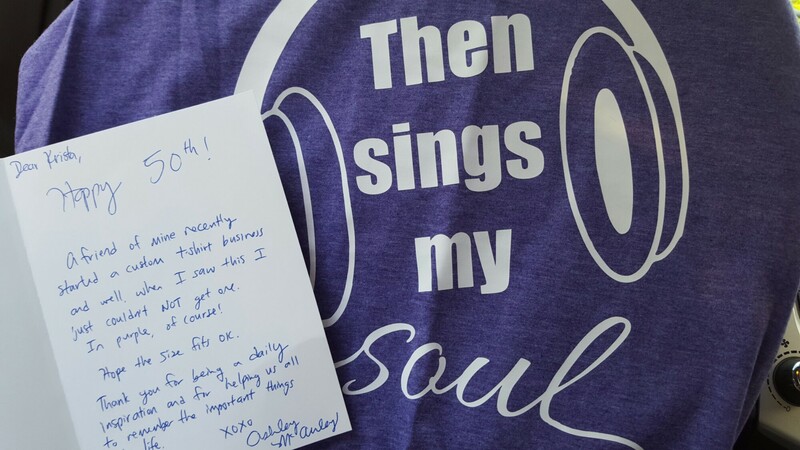 And oh, how my soul does sing…. All too often, the tendency is to be self-critical. Self-love. Self-worth. So much easier said than done. Then, one day, you step in the restroom stall only to discover this. 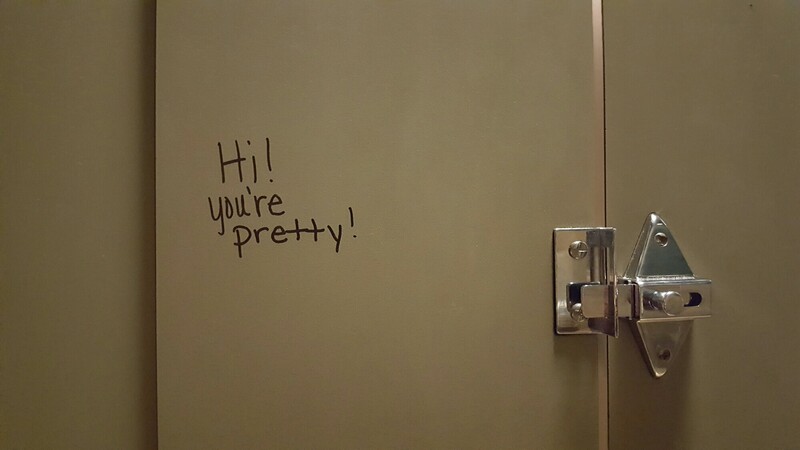 Because sometimes you’ve just gotta stop, smile, and appreciate the writing on the (bathroom) wall. and not for any reason you might imagine! In fact, the Girlchild thinks it’s hilarious. I think I’ll be wearing my hair down a lot this week…. 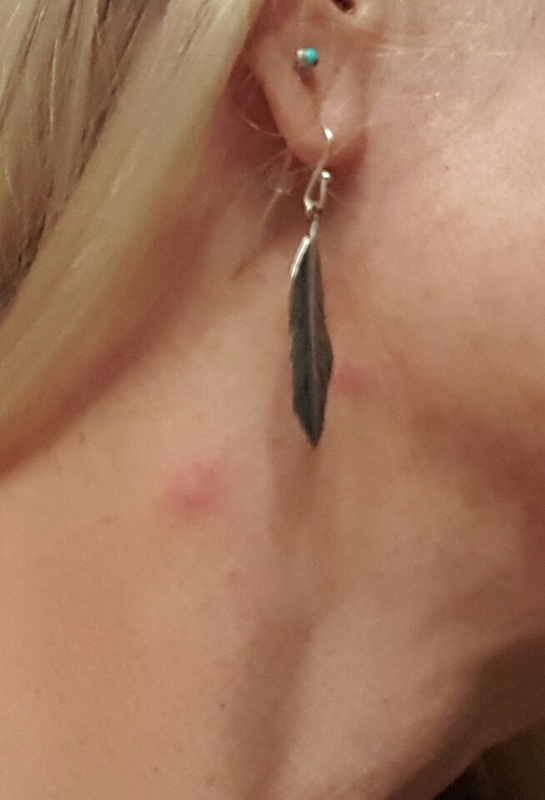 The other morning, in a rush, I pulled my curling rod through my hair just a little too quickly…and smacked it into my neck under my ear! It stung at the time, but – being in a hurry and all – I didn’t think anything of it. Later, I noticed it was a little tender to the touch, but – again – I didn’t think anything of it. Later still, I glanced at myself as I washed my hands in the restroom…. I brushed my hair back and took a closer look. All I could do was laugh out loud! Remember in high school when someone came to class with a hickey? Remember the excuses that were made? Well, y’all. I’m hear to tell you IT’S TRUE!! 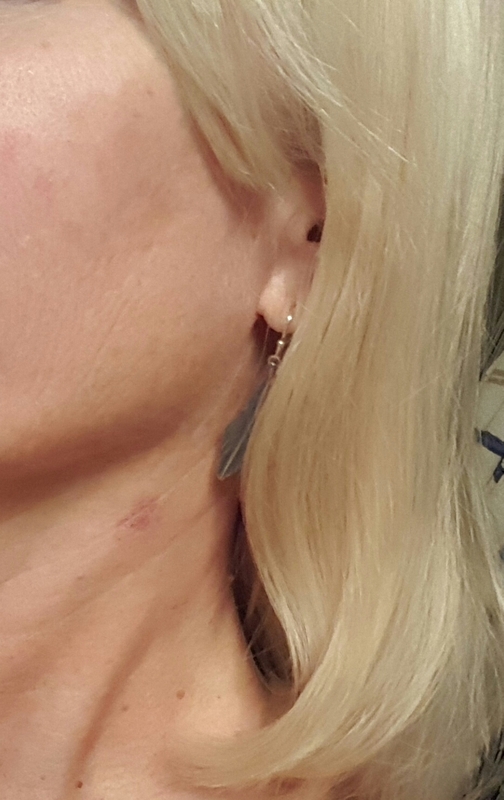 A curling iron burn looks just like a hickey. I know this for a fact. Today. At 50. Without excuses. So I’ve diligently worn my hair forward and applied the burn salve in hopes of quick healing. But this evening, I glanced in the mirror and broke out laughing…. On the opposite side of my neck, below my ear. Yep. I feel like I’m in high school! Then sings (& laughs & laughs & laughs) my soul! My people know me! Whether we’ve been friends for years or have only met virtually through friends of friends… my Facebook peeps KNOW me. The beach. Sonic tea. Herons. My kids. The grands. My friends. My family by birth,.by marriage, and by choice. BOB-FM. 80s music. The cranberry apple salad at Schlotzsky’s. 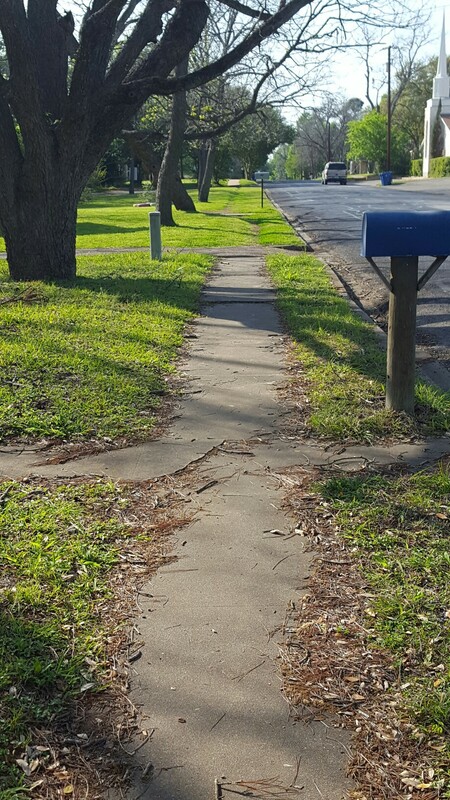 Long walks. Relay. HOPE. Sunrises. Sunsets. Birdsong. Happiness is people who know you and love you in spite of it all. Happiness is connections through a silly survey via social media. Happiness is knowing our people and the things that connect us to one another. It simply IS…. wherever we choose to see it. The rains cleared. The clouds parted. And I had my walking shoes in the car. Perfect prelude to musings on a Walk in Town. There’s birdsong aplenty and redbirds in flight. And birdsong makes my heart sing. There’s the older gentleman in his cowboy hat walking his fuzzy lapdog in the yard. He tips his hat and says hello. And the quiet calm that only a loop through the headstones, trees, and tributes can hold. There’s the smiles and waves from folks known and new. So much so, I smile and nod at each car…. just in case. But not the creepy kind. The “Hey there! Long time, no see!” kind. The “Go, Krista, go!” kind. The “It’s a gorgeous day to be out!” kind. And the teenaged boy telling his mom “I love you.” on his way out. Each of these things – and so much more. …On a walk in town. Oh how the time does fly… The kids in this picture are in high school now. Crazy, that. And when I spent my day at our high school career fair today, I saw them. And I knew them. And they knew me. And that’s not crazy… that’s crazy-wonderful! Sometimes the connection was not by name, but by something more important…. …and this precious quiet girl dissolved into a hug. I knew her by her heart and the struggles that she’d faced in school. She was one of those kiddos who worked so very, very hard, but tended to overthink and second guess herself … to the tune of failing standardized tests by 2 questions. My focus with her in intervention was always on the social-emotional side. …and it worked. On the second attempt, she passed with flying colors. A few years later, she was in a youth group as I shared my story as a cancer survivor and Relayer and invited them to join in the fight. Months afterwards, she charged me on the field at Relay and pressed something into my hands. “Read it later,” she said. I read it… and cried and cried and cried. 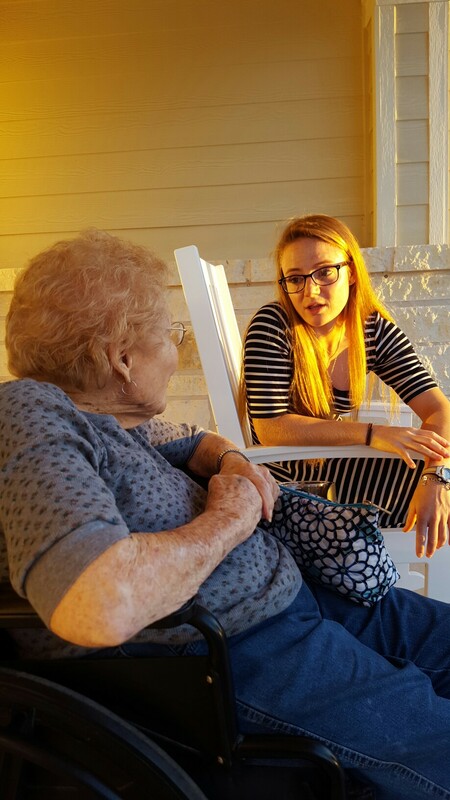 This young girl’s precious heart… it touched my heart! But as I looked into her eyes and knew all these things today — I could not pull up her name. …and we talked about her goals and dreams and the steps to get from Point A to Point B… We reminisced about the lessons she’d learned years ago: to stop, to breathe,and to believe in herself. It all happened in a moment… so brief, so fast. …. and 10 hours later, I’ve remembered her name. As in … nothing will ever compare. 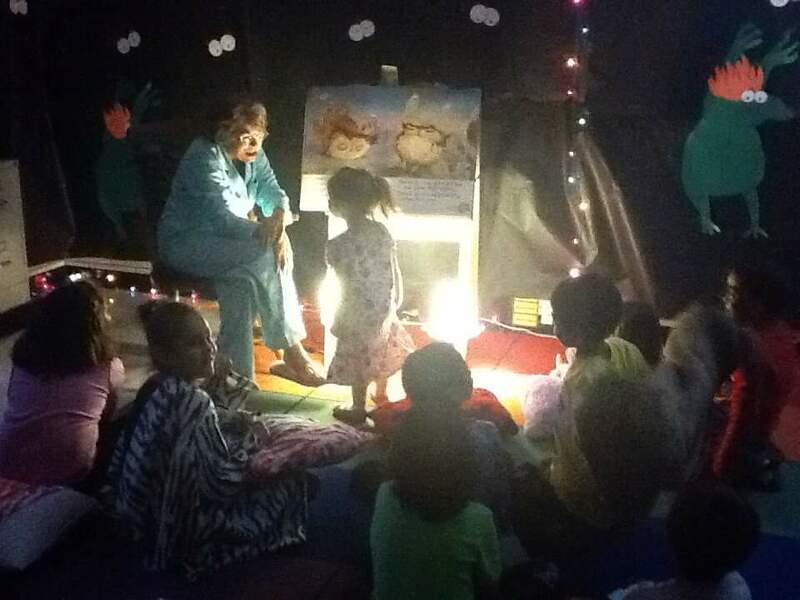 In the photo – snapped at the 1st annual Reading Under the Stars literacy night at EES – Connie P, veteran 1st grade teacher and a legend in her own time, is reading to a group of kiddos in a classroom decorated by her team. The little girl? We don’t know who she was…. Probably the sibling or neighbor of a student. But we don’t know. All we know is that this precious girl was captured by literacy that night… swept up in the beauty of the read-aloud… the rhythm of words… the cadence of Connie’s voice… the magic. It’s The Magic that Connie knew instinctively how to ignite. She led them to literacy. Through practice and patience and sight word after sight word (even when she had to sneak home the Build Up books because they were frowned upon by current educational practice). But most of all, through love…. Love of books. Love of language. Love of poetry and structure. Love of her kids. Most of all this: Love. Of. Her. Kids. And the definition of Her Kids didn’t stop at her door or even at age 7. 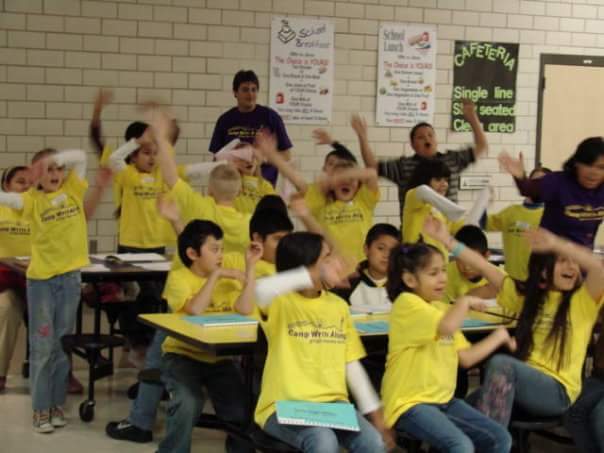 Connie taught her class and pulled in struggling readers from across and/or down the hall. She pulled in accelerated readers from Kinder and struggling kiddos from 2nd (& up). If you needed to learn to read, she was your Gal. And what a Gal she was…. Because her touch reached farther still — to the classrooms and hearts of teachers on her team– especially those of us who were young and green when we came to 1st grade. 27 years ago, I was one of those. It was 1990 and whole language was in full swing. Connie shared with the 4 of us new to teaching and the team the secret of her success. And it didn’t match what we’d been reading in college… so we smiled and nodded and cut out lily pad after lily pad after lily pad for thematic Frog and Toad vocabulary words. But then we saw her results. Her kids had The Magic. They got it!! And we began to, too. We learned because she Loved. She guided with practice and patience … and may have accidentally slipped class sets of build-up readers into our boxes. All this is not to say that sight word drill is The Answer. But, when factored into the Love and Magic equation, it’s pretty dang powerful. Connie touched the lives of all whom she taught. Her students. Our students. Us. To do the math would be staggering… In addition to her 30+ years of students, she mentored at least 2 dozen new teachers — some of whom are entering their 30th year in the classroom, others of whom are teaching teachers. Or hiring teachers….That’s my job now. She not only touched the future, she changed it… 100% for the better. Oh, Connie. How we miss you… but we’re paying forward your gift every single day and hope we make you proud. You, my beloved friend, touch the future. When I see that a young man has 9 weeks of chemo starting soon…. Because this is the CURE to the form of stupid cancer that has attacked his body. Because she has such tremendous strength. She’s conquered disease before and I fully believe she’ll do it again. But what I HOPE most of all is that one day… one day very, very soon… the news I hear in and out of each day can skip some of the yucky parts. Until then, I’ll wait and I’ll pray and I’ll do whatever I can in the fight against stupid disease…. 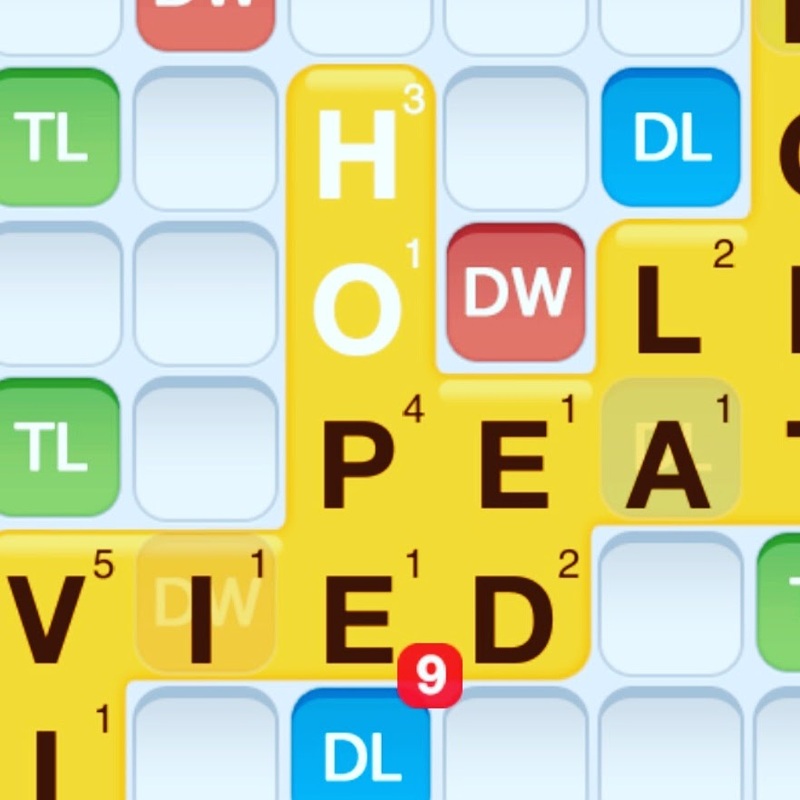 and I’ll always play HOPE.